As a region, Scandinavia is home to some of the world's most striking landscapes, vibrant cultures, and legendary traditions of anywhere in the world. While the famous aurora borealis (or Northern Lights) are a draw for many, there's more to this vast region than the dramatic night sky. 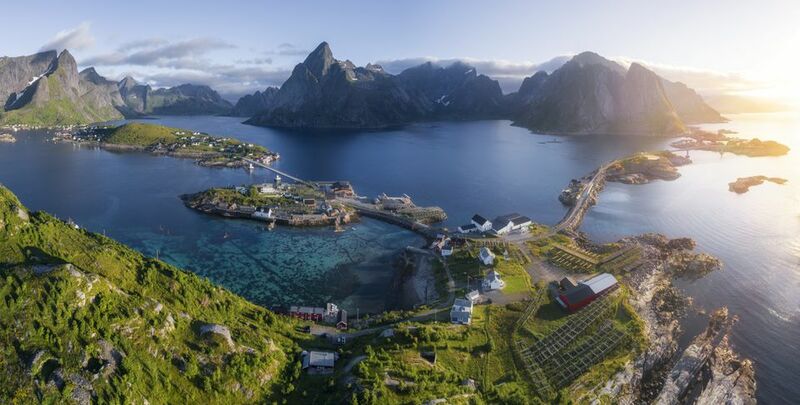 From royal palaces to sandy beaches and dramatic fjords, here are the 14 best things to do on your trip to Scandinavia. Everyone's seen the Instagrams: One of Scandinavia's top attractions in undoubtedly the Blue Lagoon, a series of naturally-heated thermal pools near Iceland's capital Reykjavik. The warm waters are rich in minerals such as silica and sulfur, and some visitors claim that bathing in the lagoon can help treat skin conditions. The pools are always pleasantly warm, usually around 100 degrees F, and are open from the morning through the evening. The Northern Lights are one of Scandinavia's best attractions. Tromso in Norway is the best place in Scandinavia to watch the show, which can be seen only in polar regions. The effect is caused by particles from the solar wind getting trapped in the Earth's magnetic field. The lights "turn on" when particles crash with the atmosphere, which results in a showing of colored flames. An unexpected plus for most first-time visitors, Denmark is home to an incredible selection of ancient castles. After all, it is the oldest continuous monarchy in Europe. Copenhagen's Amalienborg is one of the must-visits for most visitors. The royal couple's winter residence, this castle is built in the classic Rococo style. The public can visit both Christian VIII's and Christian VII's palaces. Sweden's capital Stockholm is one of Scandinavia's top attractions by itself. This city offers so many exciting sights and history that travelers often find the best way to explore this city is a guided tour, with plenty of photo opportunities. If you're short on time, one of the best ways to tour Stockholm is via the city's Royal Canal. These tours are inexpensive and begin at Djurgarden, passing Fjaderholmarna, Prince Eugen's Waldemarsudde, the Vasa Museum, Sodermalm, and Slussen, among other city landmarks. These beautiful gardens in Denmark offer peace for everyone and let you get away from the busy city life for a while. During the Baroque period, French design had a strong influence on Danish castle gardens and gave them their unique flair. These quiet retreats should be a part of your trip if you are planning to visit the Copenhagen area. In Scandinavia, whale watching is very popular among tourists, and many travelers choose to go whale watching on a whale safari during their vacation in Norway or Iceland. Depending on where you go, you might spot Minke whales, humpback whales, blue whales, sperm whales, orcas, and more! Adventurous travelers can even sign up for special whale safaris offering to let you swim with the whales. The famous Danish theme park Legoland in Billund is great fun! The park is home to an incredible 340 billion pieces of Lego and many rides can provide entertainment for days! Every building, boat, train and car is constructed from millions of Lego blocks in fantastic detail. Winter attractions in Scandinavia? Yes, right here. For your winter vacation, this is a must. Famous from the 1994 Winter Olympics, Norway's Lillehammer area is known for the spectacular local ski terrain and the many local winter sports activities. Trysil, on Norway's Swedish border, is also one of the country's most popular ski destinations, with a rich history. It was one of the first resorts known to have held a ski competition, way back in 1862. Today it is Norway's largest ski resort, with 46 miles of slopes. If you're visiting in the summer, explore the beautiful sandy beaches in Scandinavia. Denmark is one long coastline, with fine, white sand, and beaches that become day-trip hotspots on summer weekends. One of the most popular is Amager Beach, easily accessible by public transportation from Copenhagen. In Sweden, two of the country's best beaches are Langholmsbadet and Smedsuddsbadet Beaches, both on the outskirts of Stockholm. Djurgarden is one of Scandinavia's top attractions for many travelers, and rightfully so. This famous island in Stockholm is dotted with parks, events, and activities, drawing more than 10 million visitors each year. You can spend a whole day exploring the island, from relaxing in the Galärparken or visiting the 19th-century Rosendal Palace & Garden. Finland's Koli National Park offers the country's best hiking, with truly stunning landscapes. The park has nearly 50 miles of trails, which traverse moss-covered forests and open meadows. If you head the Ukko-Koli Hill, a 1,100-foot climb, you'll be rewarded with a panoramic view of Lake Pielinen. Not into hiking? The park has excellent skiing and cycling, as well as a spa, the Koli Relax Spa. Driving across this Scandinavian landmark is a truly unique experience. The five-mile-long bridge stretches across the Oresund Strait, beginning outside of Malmo in Sweden. Then, ​the bridge descends beneath the water before re-emerging in Amager, Denmark. It's a once-in-a-lifetime drive that everybody should do at least once. If you're going to Norway, you're probably going to see at least one fjord. But in a country full of them (approximately 1,200, in fact), why not see the most beautiful one? Geirangerfjord, a UNESCO World Heritage Site, is nine miles long and just under a mile wide. It's flanked by cliffs which make for incredible views from the dozens of surrounding hiking trails. What Are the Best UNESCO World Heritage Sites in Scandinavia? Would You Stay in an Ice Hotel?